Home Uncategorized Direct-to-Shape Printing  Is Label Replacement Inevitable? Direct-to-Shape Printing  Is Label Replacement Inevitable? The industrial labels market is expected to exceed $50 billion (USD) by 2020, according to Markets and Markets, the second-largest market research firm worldwide in terms of premium market research reports published annually. It is also a fiercely competitive market that consists of more than a half-dozen label manufacturers that have had a strong foothold in the industry for many years. While digital direct-to-shape printing has been seeing growth in other printing markets such as textiles and ceramics, the packaging industry has been slow to adopt the new techniques for a number of reasons. 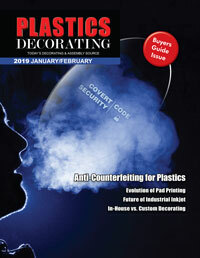 The packaging industry is charged with decorating substrates that have more shape and curvature than any other market. In addition, the variety of materials  including glass, plastic, metal and cardboard, among others  all require different pretreatment methods, while manufacturers are under changing consumer demands for personalization and more eco-friendly practices. While the advantages of digital label printing (namely personalization and short run capability) are clear, digital direct-to-shape is perceived by the packaging industry as a “replacement technology” and it is difficult to determine how much the consumer is willing to pay for these benefits. Adoption of direct-to-shape label printing is the “elimination” of the label altogether and thus a major industry game changer. In a packaging world that has consisted largely of labels used for the branding, coding and decorating of product, the idea of direct-to-shape printing is a substantial culture shift. It is one surrounded by economics, perception, new technology and new processes. But it is a shift that is likely to take shape (no pun intended) in multiple packaging sectors, as the technology and expertise continues to improve. More than just a change of mindset is the fact that the integration of industrial inkjet is a challenge in and of itself. This is not because it is more complex and overwhelming, but the simple fact that it is a “new” disruptive technology. Integrating any new technology into a manufacturing environment means process change. This can mean everything from working with digital for the first time to adapting to print head and ink changes. There are also logistical challenges that are going to require further testing and collaboration. When you are talking about the concept of jetting ink directly to substrate, adhesion and print head positioning inevitably come into play. Removing steps in the process and/or benefitting from the economics of something mean very little if quality is compromised. Maintaining optimal print resolution and acceptable adhesion cannot “take a back seat” for direct-to-shape to be fully embraced across the packaging industry. Therefore, the supply chain will need to continue to work together to overcome these new challenges and allow direct-to-shape to pick up momentum by way of being a stable, diverse solution for many. Thanks to the continuous evolution of digital printers – and specifically the capabilities of the print heads themselves – quality, consistency and feasibility are among the challenges the industry is taking head on. Digital printing already eliminates costly parts of the analog process, but direct-to-shape printing takes it one step further by eliminating the cost of the labels and their application. Furthermore, this new process likely will spark innovation that results in new product ideas, exciting changes and measureable savings. Sound familiar? Once again, digital printing has the potential to change everything! Will direct-to-shape printing replace the usage of labels in packaging entirely? The best answer to that question might be “maybe, but not right away.” The packaging industry is a printing market that consists of many submarkets all with their own demands. At the end of the day, it will come down to a willingness to embrace the new challenges and invest with the right partner to integrate the new technology. Direct-to-shape labels will happen over time for different parts of the industry. For some, out of the box solutions are available already. For others, it will be a longer arc to adoption. As process engineers move the digital solutions out of the R&D stage and onto the production floor, they will find ways to make operational changes that save time and money, while catering to their customers ever-changing needs. Reprinted with permission. Read the original blog entry. Rick Bartelli is a digital marketing consultant for Engineered Printing Solutions, formerly known as Pad Print Machinery of Vermont. EPS is headquartered in East Dorset, Vermont. For more information, call 800.272.7764 or visit www.epsvt.com.